6.60 points at 20 votes (rank 466). The Durrs from the planet Suna have broken through the defensive forces of the Earth. In an unexplored region on our planet they errect a fortress with an atmospheric machine. This enables them to change the weather on Earth to their wishes, to create a glacial period and loot all resources of the Earth. You are Lance Gryzor, a member of the United Earth Defense Forces, who has seen through the intentions of the Durrs. Our hero's task is to invade the fortress, passing the androids, and to destroy the heart of the complex, the atmospheric machine. Numerous dangers as e.g. different weapon systems, deadly tunnels and aliens try to stop Lance. There is only one man who can bring this mission to a successful end - his name ...... Lance Gryzor! 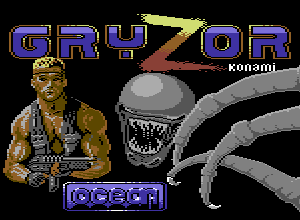 There is a title melody which is played while the title screen is shown. In the game there is a different sound which, however, repeats in all sections of the game. Three different sound effects when firing the corresponding weapon. 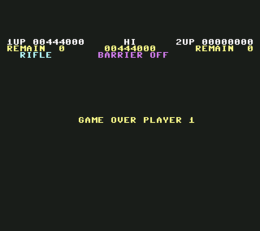 In the upper section the score, number of lives, the current weapon system and the highscore are shown. As the controls (joystick + space) were - to put it mildly - unfortunately chosen, it is probably most reasonable to fasten both joysticks ad jump with the second fire button. 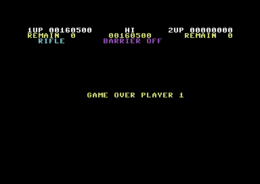 In the CCS64 emulator you can set the fire button 2 to the "space" key under "Options/Input/Define Joystick Special" and with this shoot by pressing fire button 1 and jump by pressing fire button 2, which facilitates the whole thing enormously. Werner: "I like the sound in the game very much. Unfortunately, it is repeated in every section. The sound effects are very meagre, the graphics sufficient. Poor controls because the space key (maybe with the foot) is needed additionally to the joystick. What is left is in spite of everything still a difficult, but fast and good shooter, which you play best fully on the emulator with keyboard. 7 points." TheRyk: "If the controls had been coded less complicated, this one might have been a real hit. Of course it is normally impossible to call more than one fire button seperately on the C64, so that it wasn't totally extraordinary to use space key in games in addition to joystick controls, e.g. for throwing grenades, toggle weapons etc. But space for jumping in a game in which you jump approximately once per second, wasn't a good idea. A pity, but in spite of the good audiovisual performance I can only rate ths 6 points." 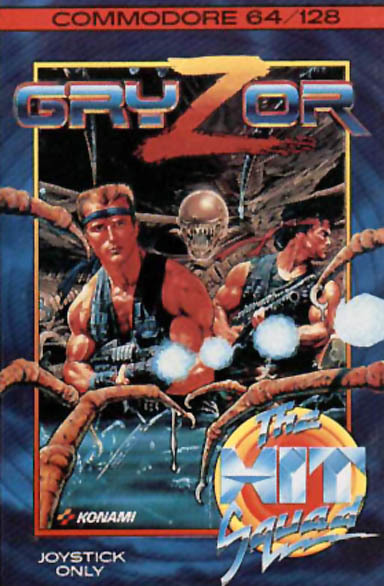 Gryzor in the Killer List Of Videogames. This page was last modified on 12 August 2017, at 13:38. This page has been accessed 5,454 times.